The Atlantic Pygmy Octopus is also known as the Dwarf Octopus, and is covered with chromatophores that allow it to change colors quickly to mimic its surroundings. Unlike most animals, the Octopus has a rectangular pupil. It usually comes out at dusk to feed on small invertebrates or small sleeping fish. It uses its eight tentacles to bring the catch to its beak-like mouth. Of its total length, the arms will represent about 70%, with the mantle comprising the rest. The Octopus will do best in an aquarium if provided with plenty of live rock and ample hiding places and a large area in which to move. It prefers an aquarium with caves and medium to coarse substrate with low lighting levels. The ideal lighting for this aquarium is dim actinic lighting. The Octopus can be surprisingly strong, so in the home aquarium, it is best to anchor the rocks, or even glue them together to keep the Octopus from toppling the rocks into the glass or onto itself. Cover all tank openings very well or it will try to escape. The Octopus is sensitive to high levels of nitrates and phosphates, as well as any copper-based medications. It its best to maintain the Atlantic Pygmy Octopus in a species only aquarium with some live rock to aid in water stability. Always approach the Octopus slowly to avoid causing it to release its ink cloud in defense. In the aquarium, this release of ink will necessitate a large water change to avoid its death. 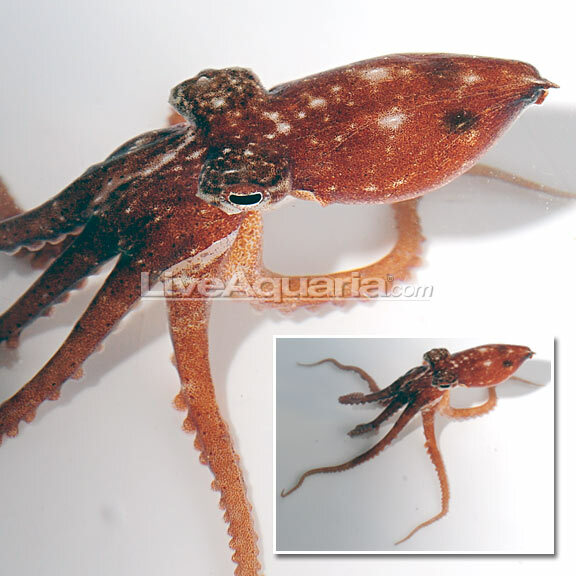 The Octopus can be fed small live feeder shrimp or freshwater ghost shrimp. feeder shrimp. Any live foods should be fed spirulina based dry foods, plankton, and cyclops to enhance their nutritional value. Wish they lived longer, that is what will probably make me never try one. Thats why you should try one. You only have to deal with its special needs for about 6-12 months. Mine last about 4-6 months. But was awesome the whole time. anyone have one of these guys? I wonder if in retirement I'll have time to try all the things I never have time to because I'm always working? I would do it again. Only problem is, they don’t have a very long life span.